This gorgeous Beaux Arts townhouse in Carnegie Hill is truly one-of-a-kind. From the moment you enter, the scope of the double height living room takes your breath away. The ceiling in the entryway is impossibly high, and you can see more than eighty feet back, all the way to the garden. Original wood-burning fireplaces, charming round nautical windows, and stunning mahogany woodwork permeate this unique home. With the amount of sunlight that comes in on a sunny day, between the copious windows and the four skylights on the top floor, you’ll think you left the lights on. 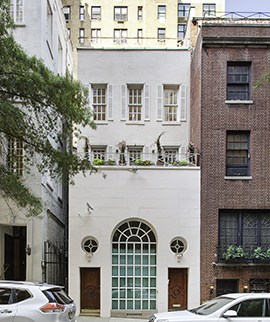 This house was owned in the 1950s by Patrick Dennis (also known as Edward Everett Tanner III), creator of Auntie Mame. Many of his decorative flourishes have survived to the present, and great care has been taken to create convenience for the 21st-century owner: every floor has an audio/visual intercom, and central air conditioning has been installed, with three zones. There are two different outdoor spaces, both with their own lighting and irrigation. And the Carnegie Hill location simply cannot be beat; it’s just one house off the corner of Park Avenue, a brisk seven-minute walk from Central Park and Museum Mile. 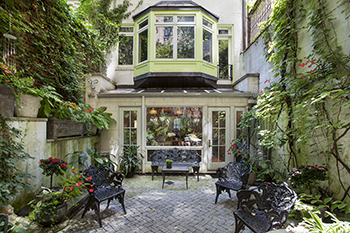 NYC townhouses for sale under $4M!